#CPCRetroDev 2018 - Amstrad CPC Game Creation Contest new for 2018! Re: #CPCRetroDev 2018 - Amstrad CPC Game Creation Contest new for 2018! Congratulations to Operation Alexandra and everyone who took part. I was very honoured to be asked to be a judge again this year, and it was extremely tough choosing my top 4 especially - I did a special scoring system for myself and there was literally 1 point in between each game I chose for that top 4. The standard this year has been amazing again! This year's CPCRetroDev 2018 has been mouth watering for the Amstrad CPC as throughout the competition we have seen many fantastic entries announced such as Jarlac, Legend of Steel, Operation Alexandra, The Adventure of Timothy Gunn, OPQA vs QAOP, Crimson Knight Adventures and many many more making a grand total of 41 enteries. I'm really excited to reach 5th position with my game, given that is the first time participating in CPCRetroDev and above all because there were a lot of great games this year. My congratulations to the winners of the CPCRETRODEV 2018! Very surprised that my game Foozzzball reach the 7th place! Thank you very much to the organization and all the people who have made it possible. What emulator are you using ? I've tried with winape and CPCE95. I use WinAPE. Download of .dsk should be 200kb, try downloading it again! It works in this way. Thanks. Congratulations to everyone for making the games and of course to the winner!I am very happy to have participated for the 1st time with my game in Basic <Penalty kicks>. Thx also to the university of Alicante for making this contest! Looking forward to download the games! Thanks to all the participants who have entered such great games in the competition. It was also a great honor to be part of this years jury and of course being part of the price giving ceremony (although I was a little bit nervous ). 41 games !!! Just awesome! It's incredible to see such a dense quality this year! Operation Alexandra is a masterpiece. Seriously high standard of games! Congratulations to all participants! Top three for me; BringRGBack, Deeper Warrens and Legend Of Steel! We told you who the winners were such as Operation Alexandra, Jarlac and Legend of Steel, we are now shouting out from the roof tops that all 41 games entered are now available for download! 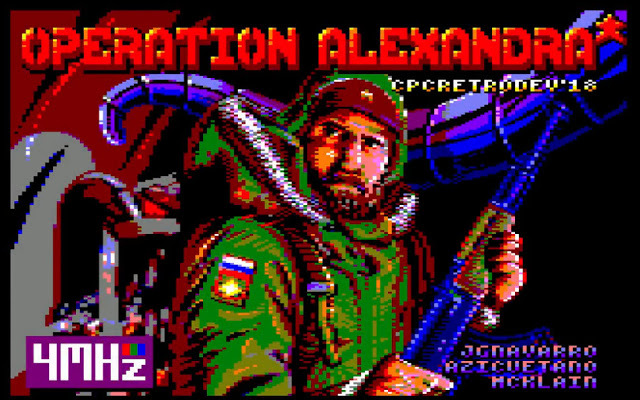 Yep agreed, loaded up Operation Alexandra and thought this is an Amstrad game of the highest quality. Congratulations to all participants! Great work!!! And a big thanks to everybody. So, here are the review, from BEST to WORST! Pretty good! Great graphics, nice music (too bad there isn't an ingame music). I didn't like the respawning of monsters, and I couldn't get rid of slimes when they are stuck to you, but rather enjoyed the game. At last, an original game!! Simple but effective gameplay, well executed. Some fresh air! Not original, but the gameplay is good and the IA can be challenging. The music is OK and the various modes make the game quite interesting. Could have been a good game, but the gameplay is a bit limited, making it only a "nice little game". Finished it in a row. The music is strange but keeps the tension. I liked the graphics. Great graphics, nice music, good animation. I can't deny the game is really well polished, with a cool introduction and ingame dialogs. Sadly, the rest is only the same platformer we have every year. Killing slimes and frogs is not much fun. The robots later aren't much funnier later. I also hate leaving a room, come back and see the monsters back again. When is kind of game going to evolve? (Note: the game crashed (CPC 6128, no extension) after the introduction, I had to reload and skip it). Some kind of Fruity Frank on LSD. Very easy at the beginning, it becomes surprisingly tricky after a few levels. Rather raw graphics and music, but I found it quite refreshing. Really cool! This is really well done. Great music! I'm not sure about the gameplay though, I couldn't score once, the motions of the players are too slow, the goal doesn't move fast enough... Or maybe it is only me? Strangely enough, I didn't quite like this one. The graphics are pretty good (though a bit messy), so is the music. But not much fun: I hated the fact that ennemies were respawning instantly when you come back to a room. You also can not kill an enemy when it is "over" you, you have to move (if you can! ), go back and kill it. All this plus the classic "I fall from a trap when appearing in a room" or "I jump to the room above, fall back to the room where I was, landing on a monster I just killed (and which I can't kill because I'm over it!! )", and you've a game to is only half-baked, in my opinion. Not much fun. Damnit, I'm really disappointed about this one. The code is great, the graphics are great, the music is OK (I would have preferred a Prohibition-like song instead of a Jean-Michel Jarre ripoff, though). But the game is incredibly badly balanced and uninteresting. On my first attempt, dozen of ennemies jumped on me, I died in a few seconds. Second try, I simply run to the right, always shooting, and after a while, there are no ennemies anymore. So I run left, still shooting, and here they are! So that's all you have to do to win. Run in a direction, shoot like crazy, and after 30 seconds, run in the opposite direction. Just like Basket Case from the same author last year, CNG Soft doesn't seem to have played his own game to see if there are fun. A gauntlet-like but not very fun. Too bad the graphics aren't better and the gameplay more varied, because the scrolling is surprisingly fast. I liked the music and the theme! But it is an "outlaw" with an even lighter gameplay. Funny for a few minutes, though. A kinda cool Puzzle Bubble clone, actually. Too bad the inertia/gravity of the characters is so simple, the motions are too slow and make the game rather dull. Cool concept, but the IA is sadly too stupid to have some fun. Not bad music. Maybe funny with 2 players. Interesting concept, but it is very hard to play efficiently because you only move in 2D whereas your opponents move in 3D... Making them very hard to kill. Too bad the game gets repetitive very quickly, I liked the theme. The music seems nice, but it SHOULD have been played every frame!! Could have been interesting, but boring after a few minutes. With a real "jump" animation it would have been much better. The controls are bit awkward too. Pang clone, not very interesting because of the slowness of our shot, and the inertia of the balls that does not change once shot. I managed to finish it on the first time though. At least this one made me smile . No possibility to retry when you are dead??? Ultra simple platformer... But kinda playable. Very simple, but not very fun game. Just go to the bottom of the screen, shoot upwards and nothing can prevent you from winning. Sadly, a terribly repetitive game. The graphics weren't so bad. Too simple gameplay for my tastes, ugly graphics and no sound. I liked the "castle" ambiance, and even the scrolling is not too bad. But there is no gameplay, and once the top is reached... What else to do? I didn't understand a lot of what happened, I shot strange monsters from a LSD trip and I guess the game was won. Not great. The gameplay is OK, too bad the graphics are ugly, and there is no animation. The idea was nice, and I kinda like the graphics (the city in the background) but the gameplay is really not good, and there is no animation. This one is, sadly, incredible bad. I can't believe this music I'm hearing. Wow, an unfinished game without collision test . This crashes at random moment on my CPC6128 with no extension. Did someone tested this on the real harware?? I'm also really surprised, once again, about how the jury gaves its points. It really seems they didn't "play" the game, but only judged its graphics and "wow" effect. A game like Deeper Warrens should NEVER have been 8th. Crimson Knight Adventures and Tautellets can NOT be beaten by The Rookie Thief and 77 Attempts, student game or not. One pervert effect of such judgment is that talented developers will not take part of this contest anymore because the quality of their production will not be judged as it should: they won't enter the contest anymore (and I know a few people who didn't enter the contest for this very reason). Anyway, this is just my opinion, I don't want to start a war, since I expected so much for these games, like every year. I'm just a bit disappointed by how it turned out, I guess. Next year will be better . It' nice you noticed the little details and the variety of levels, i give a lot of importance to these points. And thanks again to CED and CPC-Power for the great intro. I haven't played all the games, so I don't know if I can agree, but thanks for this. I think this feedback is gold, even if these aren't my games, I'm taking notes! This is the best a game developer can have: someone that plays the game and provides honest feedback (even if a bit blunt at a times, I guess there's a bit of English being your 2nd language). I've read other posts (including in amstrad.es) where people mention other games than the winners and I think that's very healthy. I love that the community doesn't have a flat uniform taste, specially when a competition like this one is perfect for experiments. Thanks @Targhan without your review i would not have tried Taulellets which is pretty fun to play! FYI: You can shoot the monsters with I, J, K & L while moving with W, A, S, & D.
I love this game and hope the developer decides to create a 128kb version with backgrounds, more monsters and music! A great effort! Page created in 0.351 seconds with 105 queries.